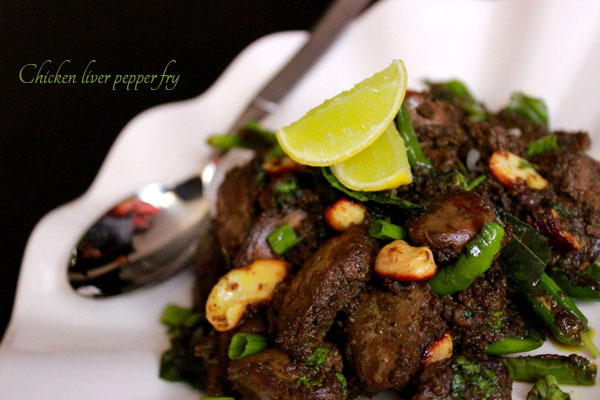 Chicken liver pepper fry is a very simple and easy method of cooking livers with very less ingredients and in a very less time. It is one of the best camping recipes. 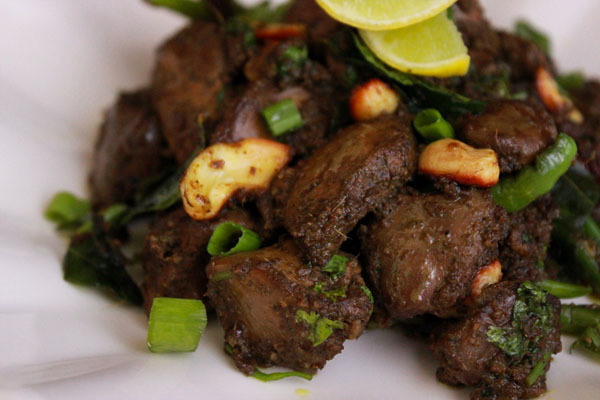 It tastes good when served with rotis(flat bread), rice or can be served as a starter item. In this recipe i didn’t use any red chilli powder or onions.try and enjoy this recipe. marinate them with salt,turmeric powder,black pepper powder,coriander powder and ginger garlic paste. let the marinade rest for 30 minutes. after half an hour, heat oil in a pan, roast cashew nuts till they turn into golden brown color and keep them aside. fry handful of curry leaves until they stop spluttering.take them out and keep aside. put the marinade in the pan and cook on medium flame.keep stirring periodically. cook for 10-12 minutes.add green chillies,coriander leaves and just give it a mix. add roasted cashew nuts and curry leaves.turn off the heat. 1.you can add onion paste if you need a little gravy.[br]2. squeeze a lemon on it before serving.